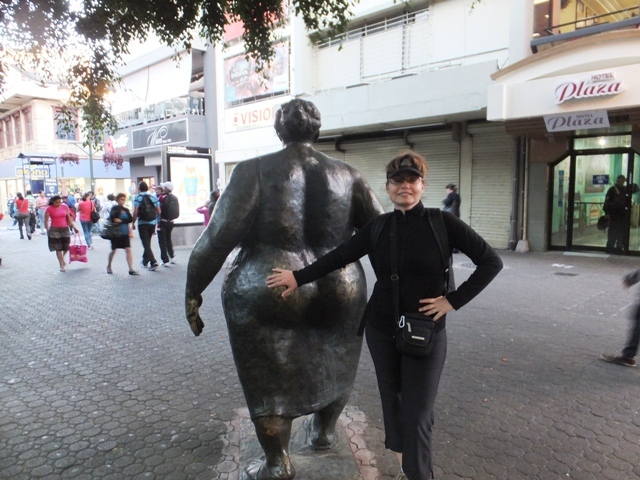 After an enjoyable guided tour of the opulent Teatro Nacional, I was ready to explore more of San Jose, Costa Rica. 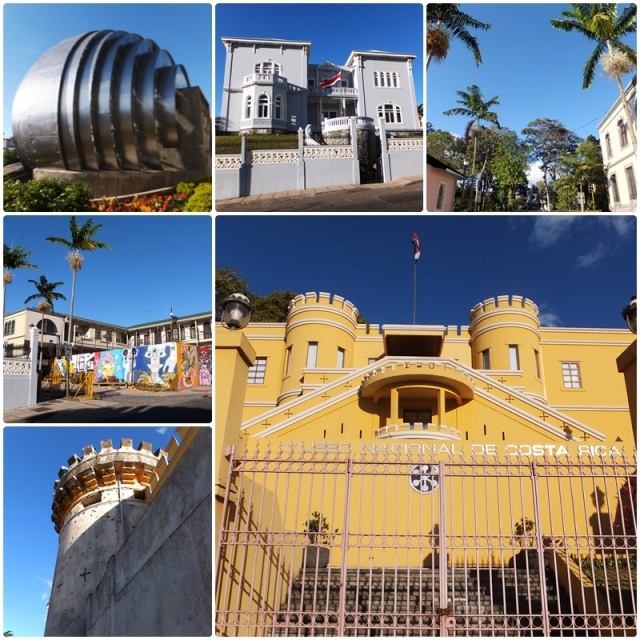 Theatre tour guide Jeff Mezas is also a city tour guide and gives walking tours of the Costa Rican capital. I joined him for his 4 pm tour on February 17, 2013 and we started with the Plaza de la Cultura, the number one place to hang out right in the center of San Jose. The large square is surrounded by major landmarks: the Teatro Nacional, the Gran Hotel, and the famous Museo de Oro (Gold Museum) and was constructed between 1977 and 1982. 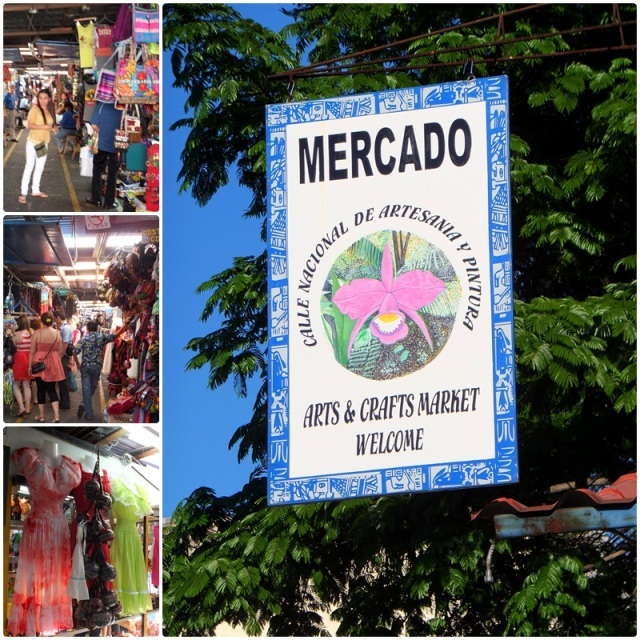 Our San Jose walking tour continued with a walk through the Mercado de Artesanias (also called the “Hippie Market”), an arts and crafts market which offers all sorts of Latin American art, jewellery and crafts and is a colourful place to discover. Just a few minutes away we reached the Plaza de la Democracia (Democracy Square). This rather austere square was constructed in 1989 to celebrate 100 years of democracy in Costa Rica. It is anchored by the Museo Nacional, Costa Rica’s national museum which is housed in a fortress that was built in 1917 and originally served as army barracks. Many government buildings are located in this neighbourhood. Jeff was explaining all the destinations in Spanish, which gave me a great opportunity to practice my favourite language. Soon we had reached the Parque Nacional, one of San Jose’s most attractive and largest green spaces in the city centre. The National Monument, cast in the Rodin studios in Paris, commemorates the heroic acts of the War of 1856. Just around the corner we stopped at the old Atlantic Railroad Station which was built in 1908 and used to be the terminus of the famous “Jungle Train” that stopped running in 1991 after a devastating earthquake. We also saw the concrete behemoth of the National Library, one of San Jose’s many Brutalist-style buildings from the 1970s. We also admired the beautiful Mexican embassy and the “Casa Amarilla” (the “yellow house”), an attractive colonial-style building that houses the Ministry of Foreign Affairs. 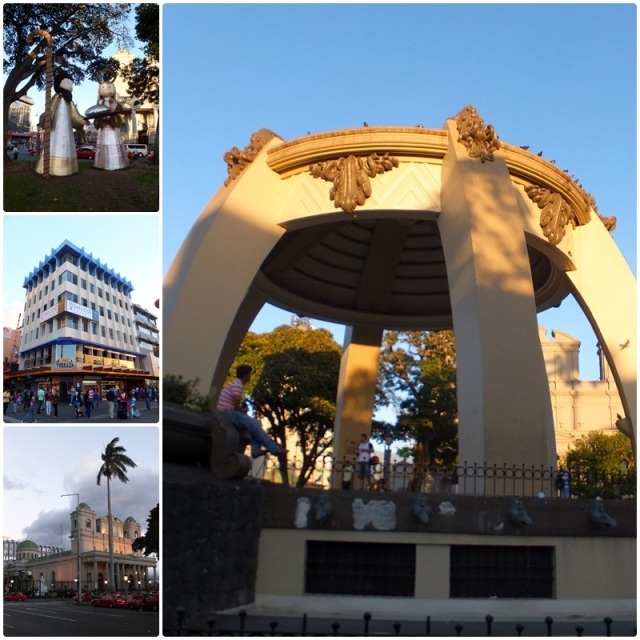 Our walking tour through San Jose, Costa Rica, continued through the Parque de España and the Parque Morazan, two attractive green spaces that are very popular with teenagers and university students. Local tourist policeman were stationed in the parks and they actually approached tourists to see if they wanted any photos taken with them. 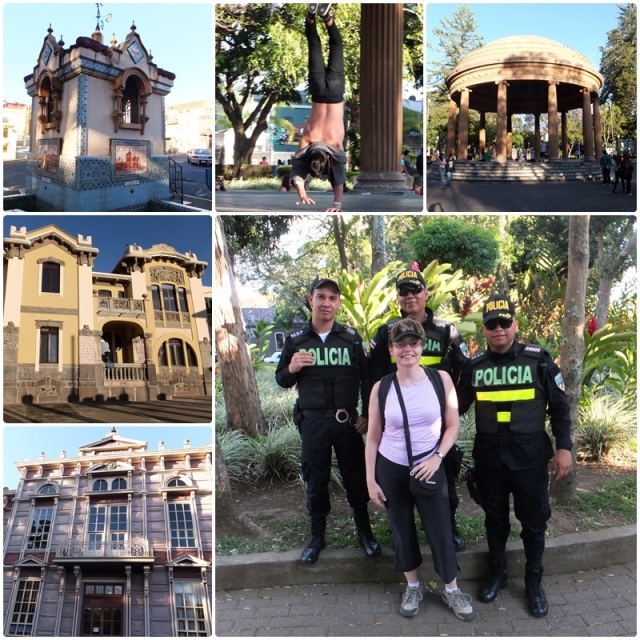 I took advantage of the offer and enjoyed the friendliness of the local police whose presence is very noticeable in downtown San Jose, Costa Rica. These gentlemen were having lots of fun with the tourists. Between these parks is the “Edificio Metalico”, a building constructed entirely of pre-fabricated metal sheets that were cast in Belgium in 1892 and shipped to Costa Rica. Local expert Jeff Meza continued to show me his home town as we approached the downtown area. He also pointed out the pink-coloured Del Rey Hotel which is a famous hangout for local prostitutes. He added it’s better to stay away from this area at night unless you are seeking a certain kind of action. 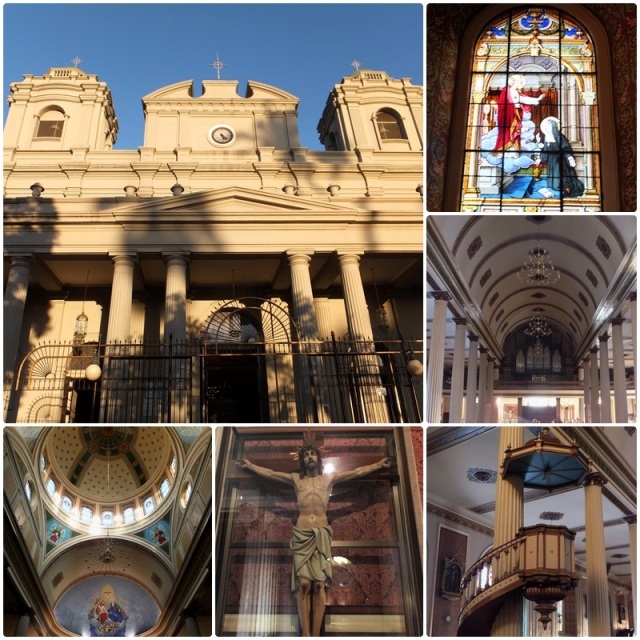 We continued our stroll through the city centre to the Catedral Metropolitana, the city’s most important church. The current building was consecrated in 1871 and replaced an original church that was destroyed by an earthquake, like so many buildings in Costa Rica. Greek Orthodox, Baroque and Neoclassical styles predominate here and the cathedral has some magnificent stained glass windows. During my walking tour of San Jose, Costa Rica, local guide Jeff Meza also took me to the Parque Central, which is anchored by an unusual bandstand that is supported by curved concrete arches. It has a great location right next to the Catedral Metropolitana, and in the evening, hundreds of green parrots descend on this square, squawking and making lots of noise. The sun was starting to set as we came to the end of our San Jose walking tour near the Mercado Central in San Jose, Costa Rica. Walking with local guide Jeff Mezas had helped me see some of San Jose’s most important landmarks in two hours. It was a great way to explore the city. I thanked him for his time and treasured the mental images of the places he had just introduced me to. 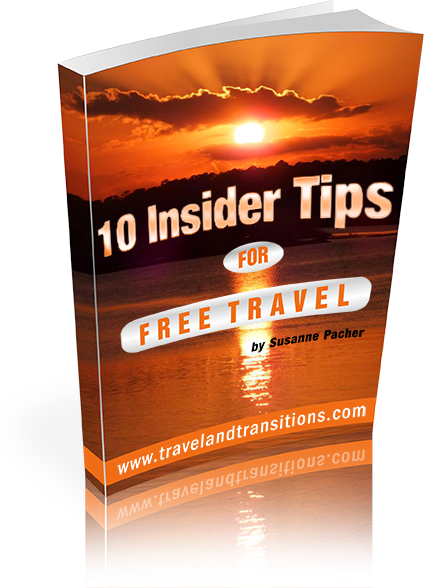 In the evening of February 17 we settled in at the Gran Hotel Costa Rica, right in the heart of San Jose. We connected with two friends from our Caravan tour who had also added two extra days in the capital. 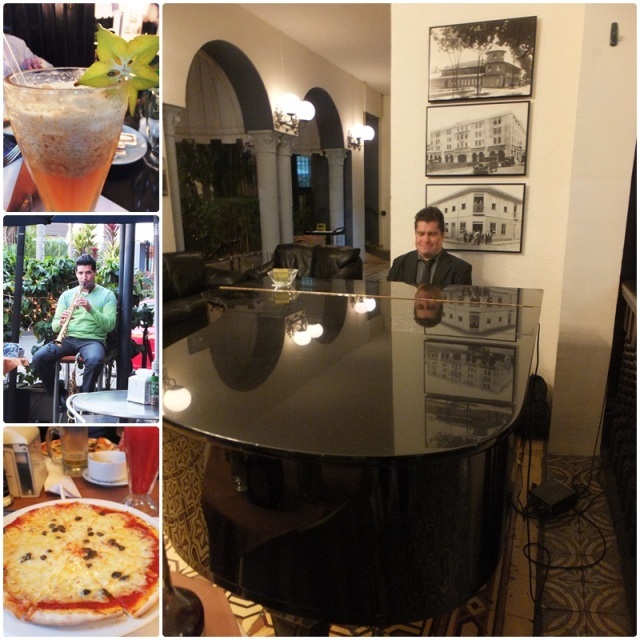 At the Gran Hotel, we first enjoyed some saxophone music and then got enchanted by some piano tunes and were duly impressed by the decadent old world charm of this historic hotel. The four of us enjoyed a nice Italian dinner and reminisced about our experiences in this Central American country. Now we had only one full day left in Costa Rica, and were discussing ideas about how to spend our final day.